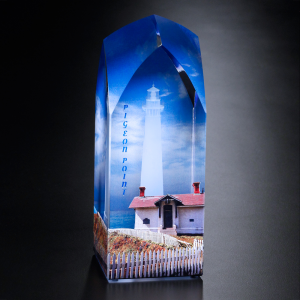 See how we used multiple imprints to create this stunning award. A luxury automobile company honored their top dealerships with an award that embodied the beauty and elegance of their brand. 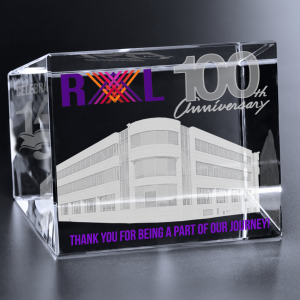 They chose an elegant optical crystal award and customized it using a variety of imprint processes. Suspended inside the award is a three-dimensional laser engraved replica of the manufacturer’s most prestigious vehicle. Spanning the entire background is a 4-color replica of the dealership entrance. To add even more dimension, the logo was added to the front of the award for all to see. Together, the mix of design and imprint on this award makes a statement of prestige and class that only a crystal award can provide. Each quarter, deserving top dealerships were presented with this stunning award. The award was designed with great attention to detail and the utmost concern for symbolizing the company brand. To download the Maserati flyer, click here. 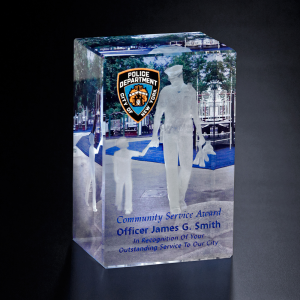 Think outside of the box with multiple imprints to create your one-of-a-kind award.